My apologies if some other blogger has already used this blog title. I can’t imagine someone hasn’t thought of it by now. So if you have, let me know and I’ll give you all the credit. It’s been a little over 2 years since I started on pump therapy. And since a commenter asked me recently about it, I thought I would write down a few thoughts while they are fresh in my mind. This isn’t so much a product review. It’s just my thoughts on living the life of a pumper. I want to stress that it’s important to work with a medical professional to find what works best for you. Officially, I’m using the Medtronic Minimed Paradigm Revel insulin pump. I’ll start off by saying I haven’t really had any problems with it. I wanted this pump for some time before I finally got it. I’d like to tell you that my choice was well thought out, and that I had gone through a few test runs of a few different models before making a decision. But I didn’t. Really, I went with the Med-T for two reasons. 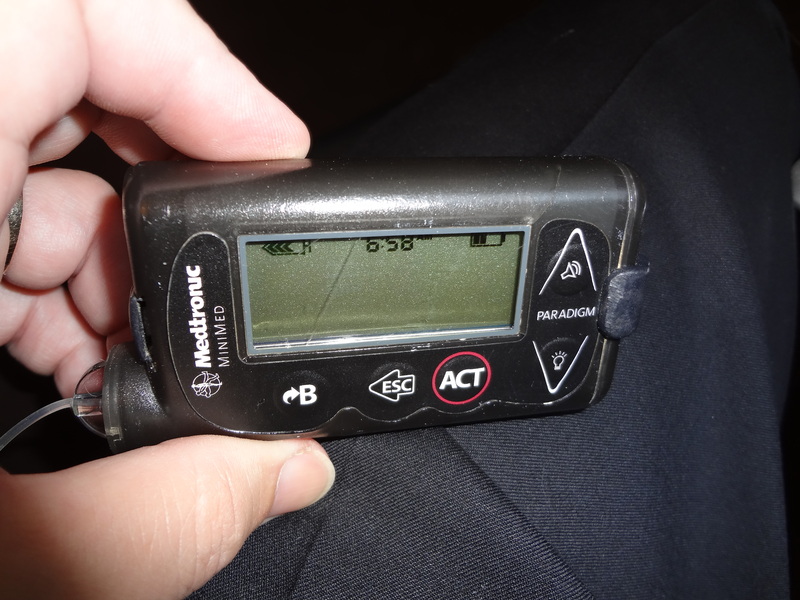 I had read the most about Medtronic, and the only other type 1 that I knew (actually– the only type 1 I know other than online) has a Medtronic pump. I did not do my due diligence, and I wish I had. That said, I’m pretty happy with my choice so far. It’s not flashy, but it does exactly what I need it to do. And it’s been extremely reliable. I’ve beaten it up some. There’s a sizable scratch across the display. I got that going a little too close to the metal part of a door frame. While wearing this pump I’ve worked in the yard and around the house. Worked out at the gym. Stood on the train platform when it’s 10 degrees and 105. I like that it’s powered by a normal AAA battery (simple things, right?). I like that I can upload data from the pump and share it with my endo. Even when the information isn’t always great. Making changes isn’t always intuitive, but I can usually figure out what to do. And Medtronic’s documentation is pretty thorough and mostly understandable, so if I can’t figure something out right away, I can always look up the answer. Now, let’s talk infusion sets. I’m using the Quick-set infusion set with the 9mm cannula and the 23 inch tubing. I need the long tubing because it needs to go down and around the dress shirts that I wear to work. Here’s another area where I didn’t do a lot of research. I honestly don’t know if people generally like these sets or not. I like them okay. With one caveat: I wish the tape holding the set in was stronger. Mostly, it seems to be susceptible to big changes in temperature, either warm or cold. And it gets a little weaker when it gets wet. So if I’m swimming one day, then running in the 90 degree heat the next day, by the third day, I can feel the set trying to work its way out. I don’t think the set is bad; it’s pretty comfortable once you get used to it. Again, I just wish I had tried out a few more sets just so I could gauge the differences. Maybe I’m using the perfect set for me. I just don’t know if it is or isn’t. Wanna talk continuous glucose monitors? I have one, but I don’t wear it often. I wear it about 2 to 3 weeks in between visits to my endocrinologist, so she can get an idea of how my BGs are trending throughout the day. Other thoughts about using the CGM will have to take up space in another post. One additional complaint: well, not a complaint as much as an observation. This is one expensive piece of medical apparatus. I don’t really see the cost in the software or the look of the device. It must all be in the durability factor, which, right now, is pretty good. I can live with that. But I wonder if a drop in the price might get a few more people access to this kind of therapy. For some, it could be a life changer. Speaking of cost: as much as I can tell, once you swallow the cost of the device (my insurance picked up a sizable portion of the bill), the ongoing cost is roughly the same as when I was on multiple daily injections. The real advantage for me is in convenience. I can go nearly everywhere with it. And I love how a pump gives me the ability to adjust my basals or boluses on the fly, based on where my glucose is at that moment. That’s a huge thing for me. So all in all, I’m glad I went to pump therapy. I’m happy with my decision to go with Minimed. If you’re thinking about going to the pump, and you have any questions, feel free to ask. Whomever you talk to, remember to ask a lot of questions! Make your choices in care from a well-informed point of view. Remember: pumpin’ ain’t easy (had to get that in there one more time). But it might be the next great step in your walk with diabetes. Good luck!